The University of Texas at San Antonio (UTSA) College of Business received a $2 million grant from the Defense Intelligence Agency (DIA) as part of its Intelligence Community Centers of Academic Excellence Critical Technology Studies Program. The grant will allow the college to expand its current Master of Science in Data Analytics (MSDA) program to offer a new track in analytics cyber intelligence; launch an intelligence studies certificate program; award scholarships and stipends to select program participants; collaborate with academic and industry partners on cyber analytics research and training; and work with the intelligence community to promote internship and job opportunities. "The College of Business has positioned itself as a leader in the fields of cybersecurity and big data analytics," said Wm. Gerard Sanders, dean and Bodenstedt Chair of the UTSA College of Business. "We look forward to partnering with DIA on this prestigious grant. It further enhances the reputation of the college's Master of Science in Data Analytics program." Led by business faculty members Max Kilger, director of the data analytics program, and Paul Rad, associate professor in the Department of Information Systems and Cyber Security, the three-year grant will run through 2021. "We are providing a critical pathway of analytics and cyber education to train the national security workforce," said Kilger, a nationally known cybersecurity expert. "Our faculty are experts in areas such as artificial intelligence, machine learning, data visualization, computational statistics, algorithm design and analytic writing and briefing." According to a recent study by the McKinsey Global Institute, there is a predicted shortfall of 250,000 data science professionals in the coming years. Graduates of the MSDA Critical Technology Studies program will have not only expertise in data analytics techniques, but also training and experience in applying these techniques in the cyber domain with an emphasis on intelligence analytics. MSDA students take classes in areas such as data analytics applications, data driven decision making, data visualization and data algorithms. They also gain experience in a number of industry standard platforms and data architectures such as R, SAS, Python and Hadoop. Six new courses in intelligence studies and national security applications will be developed for the Critical Technology Studies Program. Coursework includes The Role of U.S. Intelligence in National Security; Intelligence Reasoning and Analysis; Methods in Intelligence Collection; Analytical Writing, Reporting and Briefing to the Intelligence Community; National Security and Human-Digital Technology Relationships; and Analytic Methods, Interpretation, Writing and Briefing of Cyber Intelligence Data. Leveraging UTSA's newly-established National Security Collaboration Center (NSCC), the college will engage with partners in the intelligence community including the Army Research Laboratory, the 25th Air Force and Booz Allen Hamilton. "The DIA CAE program in Critical Technology Studies was built to provide a pipeline for partners of the National Security Collaboration Center, a government-university-industry ecosystem working to rapidly develop and prototype state-of-the-art technologies and solutions for national security and global defense. This program will create students with a global understanding of intelligence collection, analysis, counterintelligence and other key aspects within intelligence studies," said Bernard Arulanandam, interim vice president for research, economic development and knowledge enterprise at UTSA. The NSCC advances research, education and workforce development in the areas of cybersecurity, data analytics and cloud computing. "In today's cyber era, threats can easily thwart legacy defense mechanisms and learn how to behave and appear as realistic as users," said Rad, an expert in artificial intelligence, autonomy and cloud computing. "AI-based cybersecurity is critical to defending our nation's information infrastructure. The DIA CAE program grant allows us to train the next-generation workforce to implement AI and cybersecurity." UTSA is ranked the No. 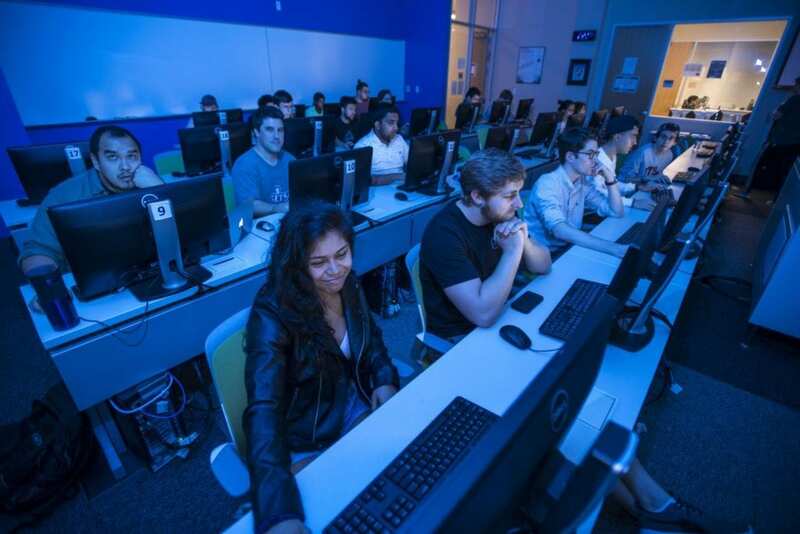 1 cybersecurity program in the nation by the Ponemon Institute and has three Center of Academic Excellence designations in information assurance/cyber defense education, information assurance research and cyber operations from the National Security Agency and the Department of Homeland Security. "As an industry leader in the defense, intelligence and cyber arenas, Booz Allen Hamilton congratulates UTSA on winning an important federal grant to work toward becoming an Intelligence Community Center of Academic Excellence," said Bob Miller, vice president and San Antonio location general manager at Booz Allen Hamilton. "This is a victory for the whole national security community in San Antonio, as it will bring additional emphasis and synergy to South Texas, by educating students and community leaders alike in the key, common issues that matter to industry, academia and government." The College of Business will also establish an academic consortium with five South Texas Universities. Consortia faculty and students will collaborate on research, participate in academic boot camps and network with local, regional and national intelligence community experts. "We are building a diverse community of scholars with an interest in analytics and cyber intelligence," said Kilger. "And, we are creating a pipeline of future students to fill the critical shortage in the national security workforce." The college launched its Master of Science in Data Analytics program in 2016. The program produces highly-skilled and educated data analysts who can convert the growing amount of data confronting all organizations into usable information for decision makers across a variety of disciplines.